This book introduces the subject of total design, and introduces the design and selection of various common mechanical engineering components and machine elements. These provide "building blocks", with which the engineer can practice his or her art. The approach adopted for defining design follows that developed by the SEED (Sharing Experience in Engineering Design) programme where design is viewed as "the total activity necessary to provide a product or process to meet a market need." Within this framework the book concentrates on developing detailed mechanical design skills in the areas of bearings, shafts, gears, seals, belt and chain drives, clutches and brakes, springs and fasteners. Where standard components are available from manufacturers, the steps necessary for their specification and selection are developed. The framework used within the text has been to provide descriptive and illustrative information to introduce principles and individual components and to expose the reader to the detailed methods and calculations necessary to specify and design or select a component. To provide the reader with sufficient information to develop the necessary skills to repeat calculations and selection processes, detailed examples and worked solutions are supplied throughout the text. This book is principally a Year/Level 1 and 2 undergraduate text. Pre-requisite skills include some year one undergraduate mathematics, fluid mechanics and heat transfer, principles of materials, statics and dynamics. However, as the subjects are introduced in a descriptive and illustrative format and as full worked solutions are provided, it is possible for readers without this formal level of education to benefit from this book. The text is specifically aimed at automotive and mechanical engineering degree programmes and would be of value for modules in design, mechanical engineering design, design and manufacture, design studies, automotive power-train and transmission and tribology, as well as modules and project work incorporating a design element requiring knowledge about any of the content described. 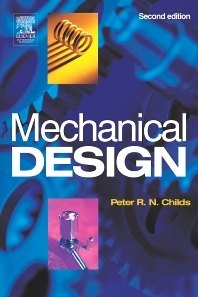 The aims and objectives described are achieved by a short introductory chapters on total design, mechanical engineering and machine elements followed by ten chapters on machine elements covering: bearings, shafts, gears, seals, chain and belt drives, clutches and brakes, springs, fasteners and miscellaneous mechanisms. Chapters 14 and 15 introduce casings and enclosures and sensors and actuators, key features of most forms of mechanical technology. The subject of tolerancing from a component to a process level is introduced in Chapter 16. The last chapter serves to present an integrated design using the detailed design aspects covered within the book. The design methods where appropriate are developed to national and international standards (e.g. ANSI, ASME, AGMA, BSI, DIN, ISO). The first edition of this text introduced a variety of machine elements as building blocks with which design of mechanical devices can be undertaken. The approach adopted of introducing and explaining the aspects of technology by means of text, photographs, diagrams and step-by-step procedures has been maintained. A number of important machine elements have been included in the new edition, fasteners, springs, sensors and actuators. They are included here. Chapters on total design, the scope of mechanical engineering and machine elements have been completely revised and updated. New chapters are included on casings and enclosures and miscellaneous mechanisms and the final chapter has been rewritten to provide an integrated approach. Multiple worked examples and completed solutions are included. Undergraduate students in Mechanical Engineering; Manufacturing Engineering; Industrial design; Automotive Engineering.